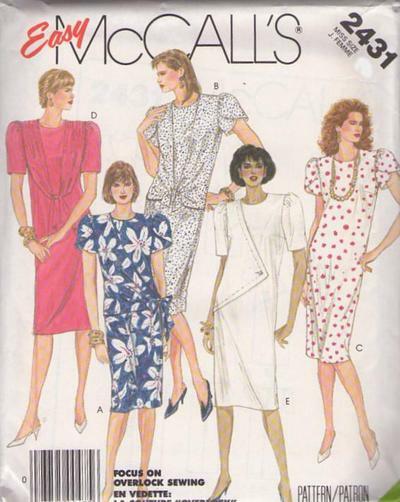 1986, 80s Career, Retro Beginners Clothing Patterns - MISSES' DRESS: Straight dress (all views) has jewel neckline, shoulder pads, short sleeves with gathered caps or two-piece tulip sleeves, back zipper opening and back slit. View A has drape with left side ties. View B and D have drapes tied at center front. View E has asymmetric, buttoned panel with top-stitch trim.